This guide focuses on the postgame aspects of the game. Therefore, it may contain spoilers of locations and enemy names, but no plot. For completeness's sake, given that it's not post game if you are lower than level 30... you can level up by merely exploring and planting probes, or Scout Recruiting a higher level and then grinding enemies 10 levels higher. 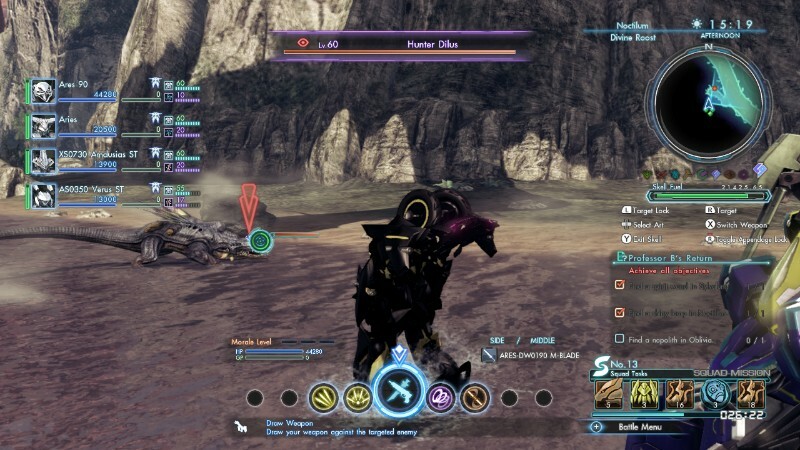 Armed with a level 30 Skell (preferably all your party), head to Cauldros FN506. Here the focus will be the Petramands. 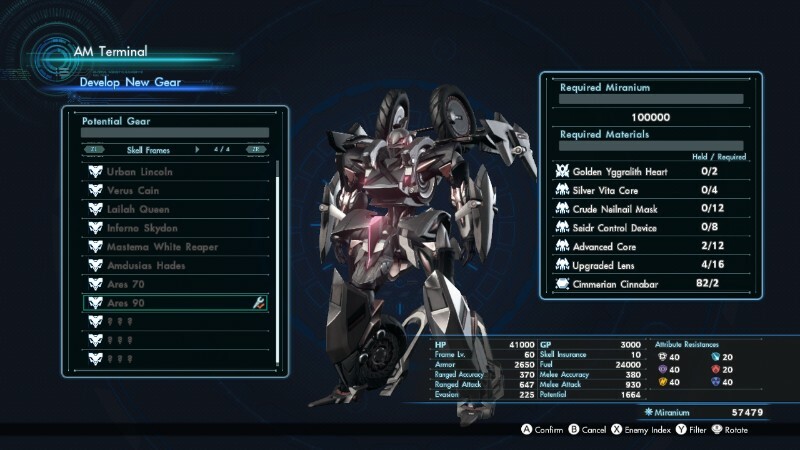 If they are too hard for you, you can head back to grind Caros (The "lions") or abuse the Skell stomping mechanics, with Blattas (little bugs) or any Ganglion foot soldier, which allow you to damage small critters by stepping them with your Skell. Even if you kill them like that, they still give Exp. Head to northern Noctilum, and farm the level 60 Hunter Dilus (They are partially under water, and look like crocodiles). Like the next layout, this is intended to be able to used at the same time as this one, for ultimate endgame income. 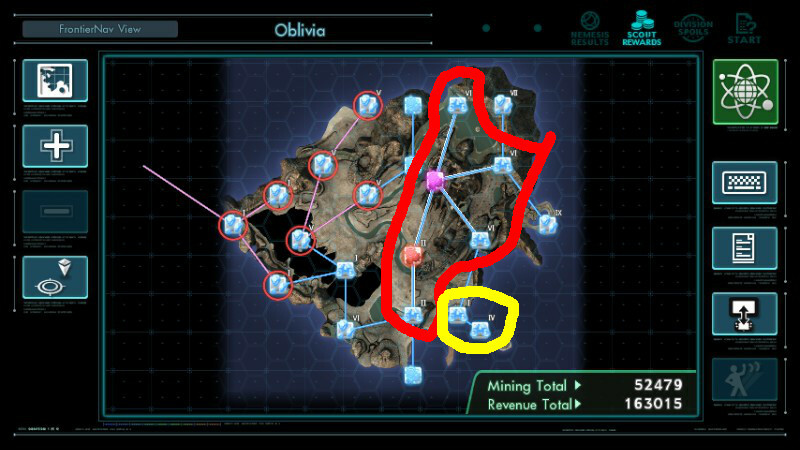 Circled in yellow, is just optional, but still a good area. But red is mandatory. To get revenue, you need to discover all the "Sightseeing Spots"
Like the previous layout, this is intended to be able to used at the same time as this one, for ultimate endgame income. 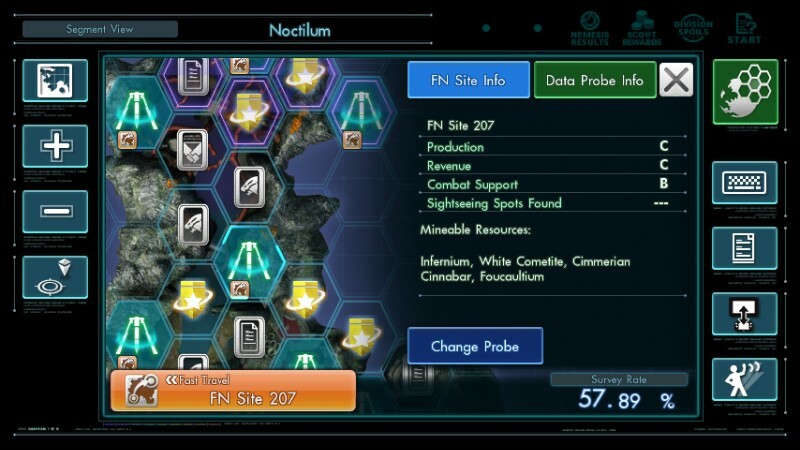 However, this one just narrowly manages it (105k storage), and through the use of all 10 storage probes. If you use the duplicator from the income layout, you can reach the 100k target for less. 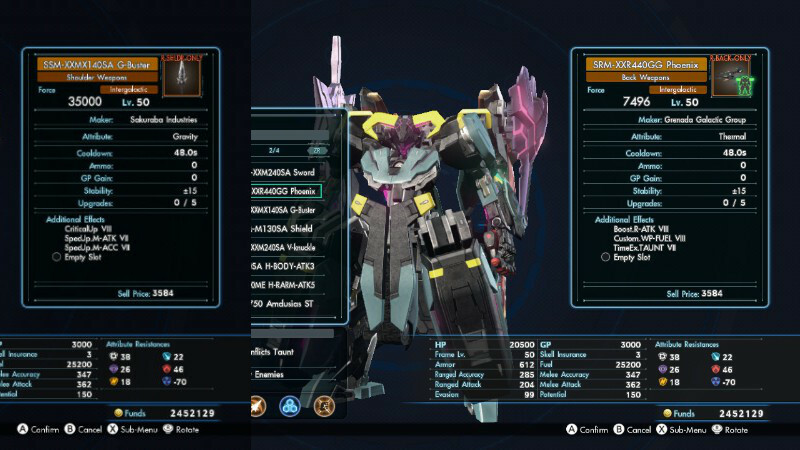 With Miranium to spare and your party in level 60, equip them any maxed Candid & Credible level 55 armor set, which has the "Treasure Sensor" augment integrated. With 3 party members, it's enough, leaving you free to wear whatever you want. This will have a very noticeable improvement in your farming: Most of your loots will be gold, with higher chances of getting intergalactic drops. 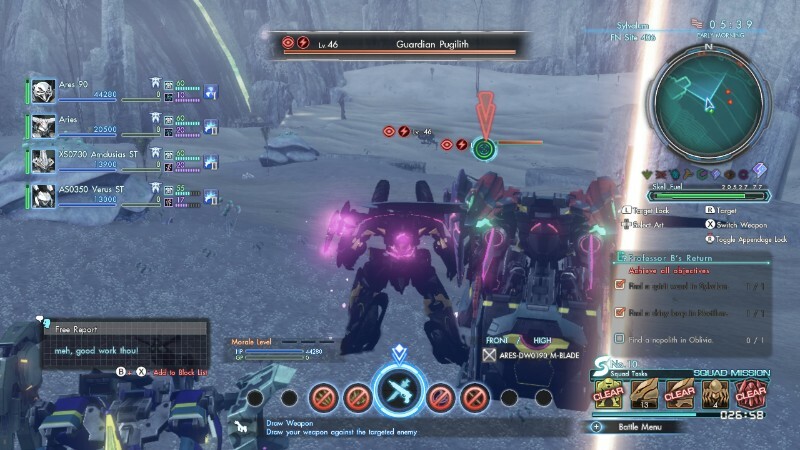 The Phoenix is a multiple hit AoE, and the Buster is a single hit heavy hitter. With the Phoenix, you can clear most mob groups lower than level 50, and the Buster handles tougher enemies. The Buster can also stagger, setting them up for a Bind. Head to Sylvalum's FN406, just north you'll find a pair of Pugiliths with a group of Puges. This are the mobs you want to clear. 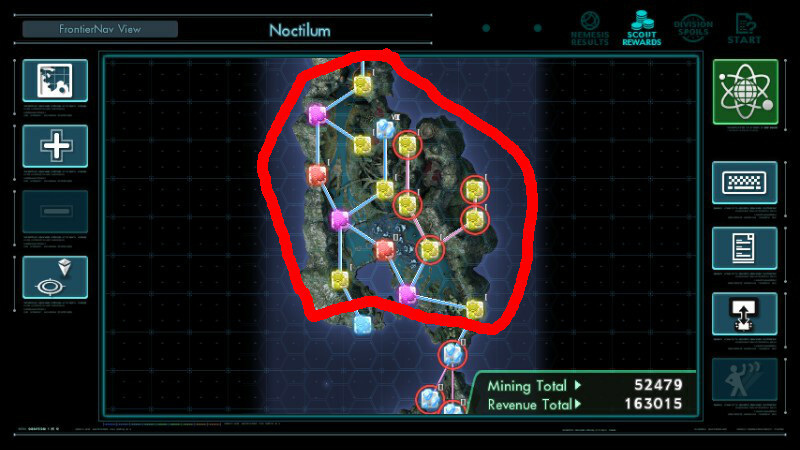 To respawn them, you can Fast Travel back to the FN site, or exit your Skell and use Menu>Party>Return to Skell. West of this group lies a Ganglion base with 2 larger enemies. Among all this drops is a shield with a Gravity art. It deals high damage and staggers, and it has a cheap fuel cost. It's not the most important piece of gear, but if you can also get it, try equipping it. Materials in red are hard to get, try to farm "Reward Tickets" to buy them instead. The Heart drops from a lvl97 boss or the hardest Global Nemesis. And the Vita Core from the hardest timed boss battle. That's how hard they are to get. Materials in yellow are a bit hard to get. Crude Neilnail Mask comes from the Dolls timed boss mission. It's ground only, so you'll need good ground gear. You can solo it with an infinite Overdrive Photon Saber build, but even with Treasure Sensors it can be hard to get the drops for some people. But when it drops, it drops in pairs. Materials in green are easy to get. Try not to spend Reward Tickets on them. 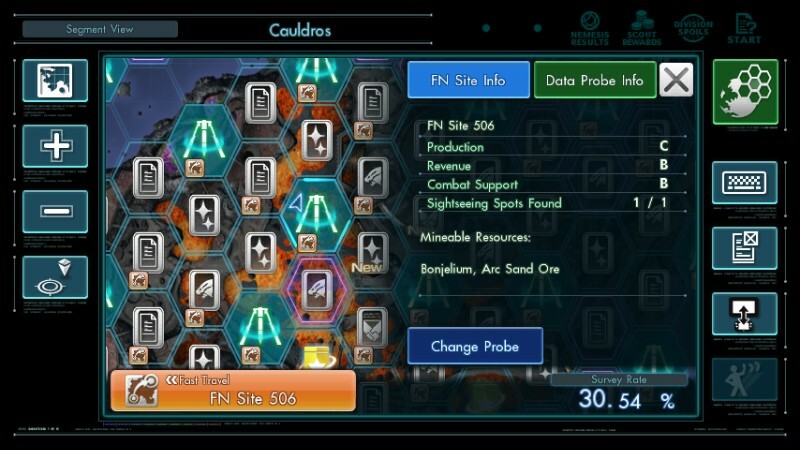 Cimmerian Cinnabar is obtained from FrontierNav Mining. 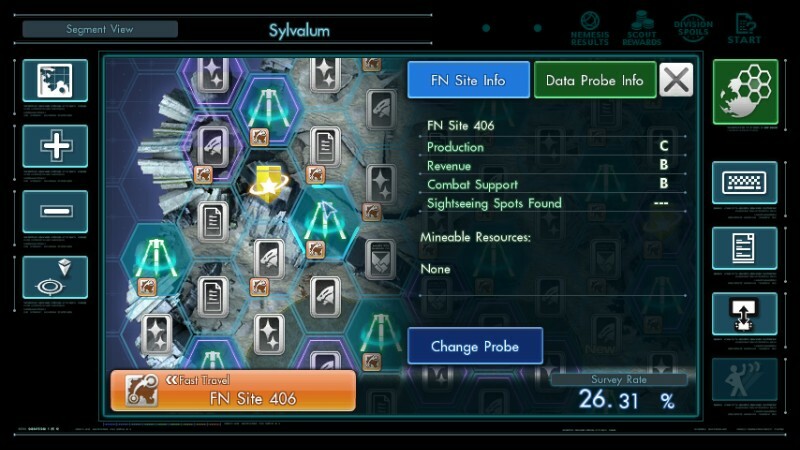 Be sure to set a mining probe somewhere where it can be mined (like FN 217). Upgraded Lens and Seidr Control Device drop from the Seidrs in the airspace of Cauldros. Advanced Core can be obtained from any Xe-dom, the easiest of which would be Molybdenum Xe-dom by Sylvalum's FN 401. To farm reward tickets, go to the Blade Scout console, and search for Scouts level 1-9. Grab 3, and take them to the Dilus grinding location. Grind until their Scout level is maxed, release them, and repeat. This will get you Blade medals. 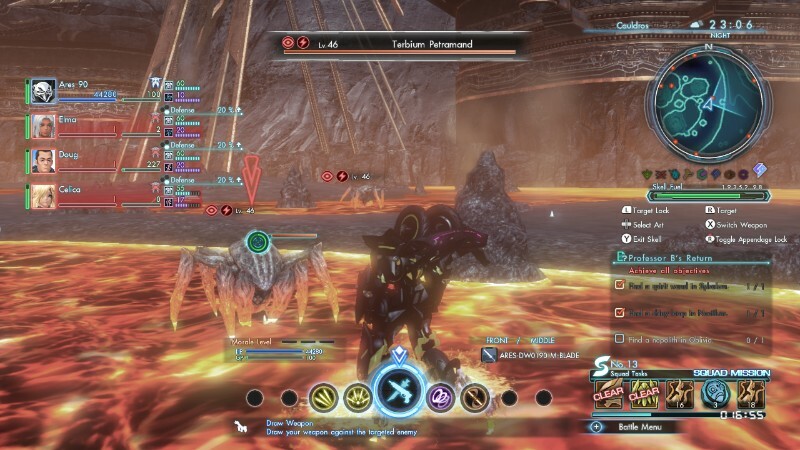 After you have the Ares 90, Yggralith Zero is prefferred. You can get between 700 to 1000 tickets with it. Fleecy Fur: Primordia 119 - Domestic Armored Suid, in general, look for any pack of suids, like the ones Ganglions use to have in some of their bases. Slimy Epithelium: Sylvalum 402 - Andrea, the Famished Hunter and its pack.